Kitchens By Design | Kitchen Design for Discerning Clients : King Street. 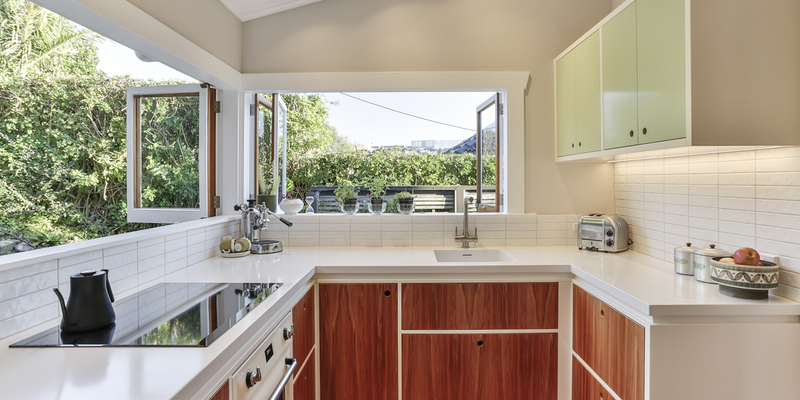 This kitchen, in a quirky little Kingsland villa, was designed to match the rest of the house style – that of mid-century design. 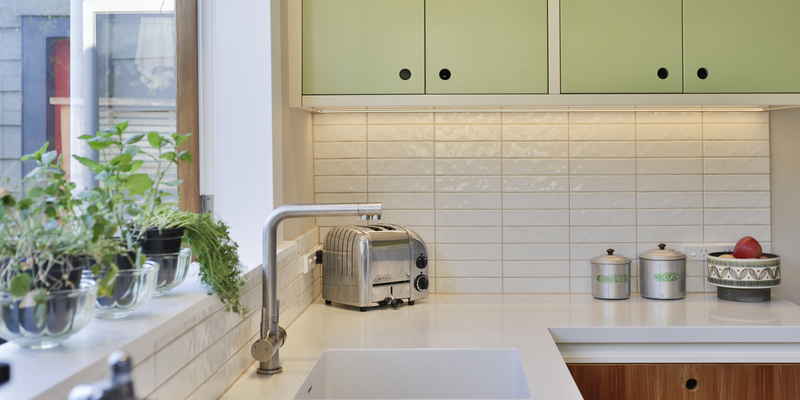 An existing, cream-coloured, retro fridge provided much of the inspiration for the project. 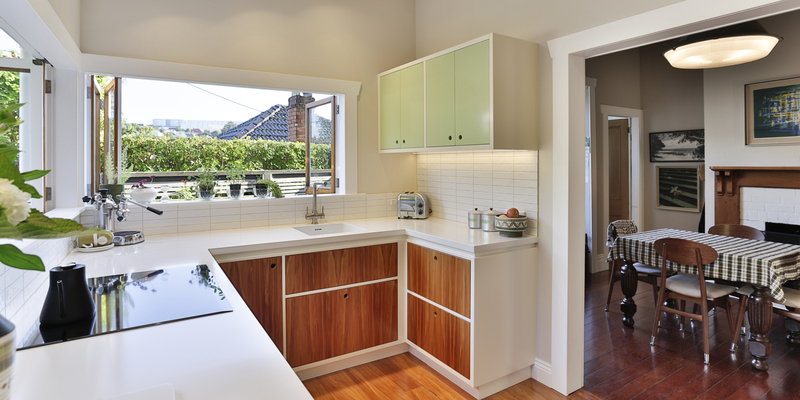 White Corian was used for the benchtop because of its seamless joining, and also because it referenced the era, as Corian has been around since the 60’s. 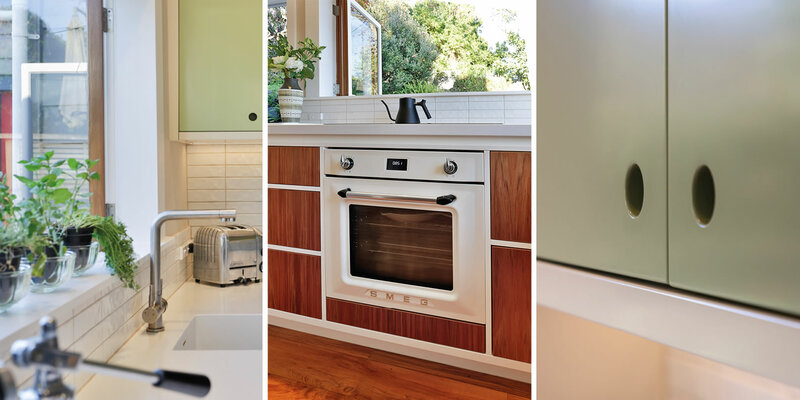 Heart Rimu veneer was used in combination with a face-frame style cabinet design to continue channelling that mid-century vibe. Georgian wire glass was used on shelving by the fridge as a way of adding another subtle reference, and the cabinetry was colour matched to Resene paints, Caper, Bianca and Scotch Mist, while the walls are in Half Tea. To complement the existing fridge, the clients bought a matching oven in the same colour. This project was a real labour of love for our clients, as they removed the old kitchen themselves and also did all the painting prep. As a qualified electrician, one of the clients carried out all the electrical work, and a friend helped them with the plumbing. This project was a real labour of love for our clients, as they removed the old kitchen themselves and also did all the painting prep.